It would be a mistake to rely on simple synonyms or mere metaphors to describe a FLYING TOUR of Hawai‘i Island. One could say it’s like a mythical ride on a magic carpet, or a scene from a James Bond thriller, with a chopper skirting a live volcano while lava oozes down the mountain slopes. But really, it’s one of those awe-inspiring things you simply have to see for yourself. The aerial view of the HAMAKUA COAST from Hilo to WAIPI‘O VALLEY is truly magical. Expect to see roaring waterfalls, vertical forests and tiny villages during a Hamakua flight. And when you reach Waipi‘o Valley, expect to see the island’s version of Eden. KILAUEA VOLCANO is by far the most popular destination—the sight of a lava flow is spectacular. BLUE HAWAIIAN HELICOPTERS offers numerous helicopter tours around the Orchid Isle that cover a whole lot of aerial ground: valleys, mountains, volcanoes, ocean, lush rainforest—you name it. They even boast private charters and a tour that takes passengers over Big Island and Maui. 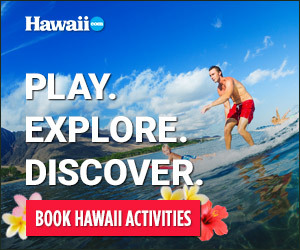 Learn more at bluehawaiian.com. BIG ISLAND AIR conducts night flights over the volcano. Paradise Helicopters also offers flights over Kilauea. Join KAPOHOKINE ADVENTURES for a HELIZIP ADVENTURE, which combines a helicopter aerial tour of Kilauea Volcano with a zipline tour into one exhilarating experience. Whether you buy a ticket on a helicopter or a fixed-wing airplane, the view from above will give you a new appreciation for the island’s natural wonders.